SIPRI had an active and engaged presence at this year's Munich Security Conference, 16-18 February. SIPRI hosted a roundtable discussion to consider the risks to peace and security posed by new technologies and the potential solutions or avenues for cooperation states can work towards. SIPRI in partnership with the Centre for Arab Unity Studies and the Swedish Institute Alexandria, launched the Arabic translation of SIPRI Yearbook 2017 as part of a two-day seminar on 'Arab Region Trends of Military Spending - Security, Defense and Development'. SIPRI agreed to a multi-year partnership with the United Nations World Food Programme (WFP) to improve the understanding of the relationship between food, security, stability and peace. SIPRI and the WFP held a seminar in Stockholm with WFP Executive Director, David Beasley. The seminar launched the partnership by considering the ways that malnutrition and hunger cause security risks and how the challenges they pose can be addressed. As part of SIPRI’s ongoing initiative looking at non-traditional security challenges posed to multilateral peace operations, SIPRI launched a new background paper. The paper explores the role that peace operations play in preventing and combating organized crime, particularly in weak or collapsed states. SIPRI has expanded and improved its online database for Mapping Arms Trade Treaty (ATT)-relevant cooperation and assistance activities to include East Asia and South East Asia. The database now contains information on over 440 cooperation and assistance activities aimed at building capacity in areas relevant to ATT implementation in Sub-Saharan Africa, Latin America and the Caribbean, East Asia, and South East Asia since 2012. Dr Ian Anthony and Dr John Hart take stock of France's new initiative, ´the International Partnership Against Impunity for the Use of Chemical Weapons´. They consider how the initiative may help hold violators legally accountable. On 26 January, China’s State Council Information Office published a white paper clarifying China’s intentions, vision, goals and objectives for the Arctic. Ekaterina Klimenko analyzes the paper and considers the policy implications it may have for China–Russia cooperation in the Arctic. Dr Amiera Sawas and Emma Bjertén-Günther explore the gender, climate change and security nexus. 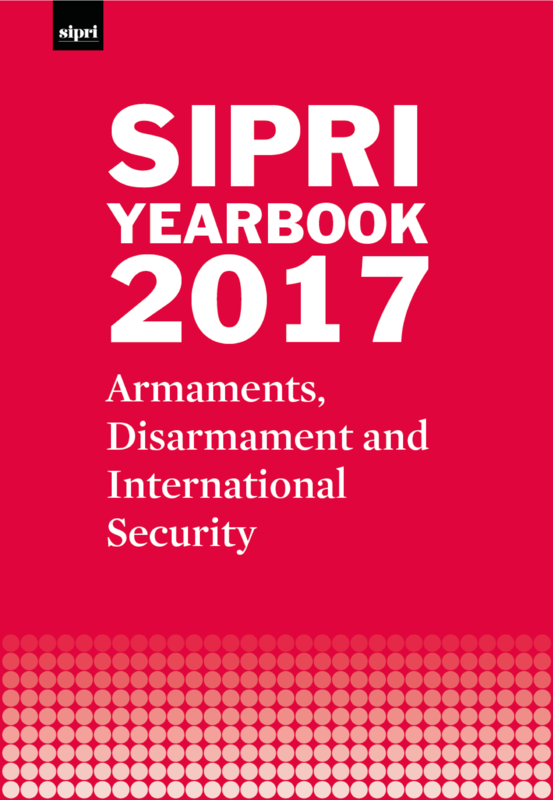 They examine the ways forward and explain how SIPRI is contributing to support a more comprehensive analytical approach through simple, practical guidance. The 2018 Stockholm Forum on Peace and Development will confront the politics of peace by assessing how different policies, processes and tools could be used to overcome political obstacles to build and sustain peace in complex environments. Information about how to register for the public portion of the Forum (7 May) is forthcoming. Attendance for 8-9 May is by invitation only. Please do not contact SIPRI requesting an invitation. SIPRI and the Friedrich-Ebert-Stiftung (FES) hosted the second of three workshops within a joint project that examines the security implications of the 21st Century Maritime Silk Road (Road) in Yangon, Myanmar. The workshop facilitated a discussion on how the Road has affected security dynamics in the Indian Ocean Region to date and how it may affect dynamics over the medium and long term, particularly as it relates to the European Union’s (EU) economic and security interests in the region. SIPRI, together with the World Food Programme (WFP), held an event in central Stockholm to ask, ´In what ways is hunger a security risk and how can we work together to address the challenges?´. SIPRI, together with the US Department of State, hosted a workshop on, ‘Controlling Intangible Transfers of Technology (ITT): Mapping Key Challenges and Good Practices and Identifying Areas of Improvement’. The aim of the workshop was to discuss key issues related to the application of export controls to ITT, as well as to explore how their implementation could be improved by national authorities, by the EU, and through the use of available guidance materials. The New Geopolitics of Peace Operations III: Non‑Traditional Security Challenges project seeks to enhance understanding about peace operations and non-traditional security challenges such as terrorism and violent extremism, irregular migration, piracy, organized crime and environmental degradation. As a part of this initiative, this SIPRI Background Paper explores the challenges that terrorism and violent extremism present to multilateral peace operations. This SIPRI Insights presents a concise analysis of how three regional organizations in Europe with a security mandate have responded to climate-related security risks. The main findings stress that all three intergovernmental organizations (IGOs) acknowledge climate change as a ‘threat multiplier’ (i.e. a factor that might exacerbate existing drivers of instability and conflict) and are addressing climate security to varying degrees within their mandates. The EU and the Organization for Security and Cooperation in Europe (OSCE) are actively seeking to incorporate climate security in efforts to promote peace and security, whereas the North Atlantic Treaty Organization's (NATO) role currently remains more limited to disaster response. This working paper traces the national climate-related security policies of the five permanent UN Security Council members: China, Russia, the United States, the United Kingdom and France. Specifically, it examines how more traditional security actors within each country have assessed the risk of climate change on national security, and the extent to which they have begun to incorporate any identified climate risks into their plans and operations.